You can conduct surveys to collect information from your members that will be helpful in strategic planning for your association. 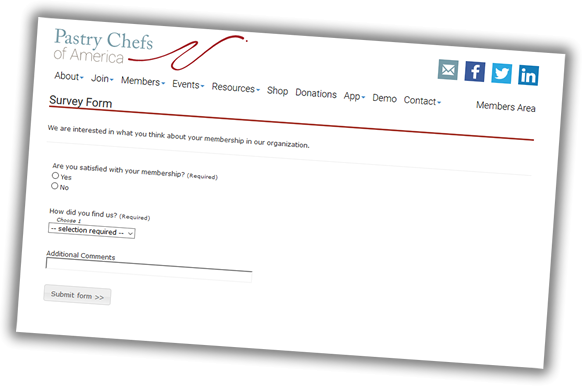 Email to Members - Once the survey is built, you can email it to your members with member-encoded links to easily allow them to complete their survey. In so doing, you can track who has completed the survey or not, and you can then remind members until they complete the survey. Reporting - Statistical reporting can then be done on the results. Member-level Tracking - This module is designed to restrict feedback to one-response-per-member. If ou need to collect surveys from the general public, we recommend using the Forms Builder module.